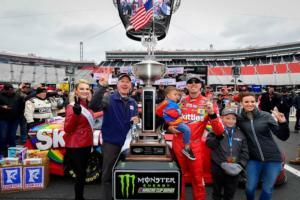 Kyle Busch earned his seventh career Monster Energy NASCAR Cup Series victory at Bristol Motor Speedway with a timely tap to Kyle Larson's rear bumper six laps from the finish of the Food City 500. Larson was leading when Busch executed a textbook bump-and-run in Turn 3 to take the lead and remain red hot on a cold day at the high-banked, half-mile track. 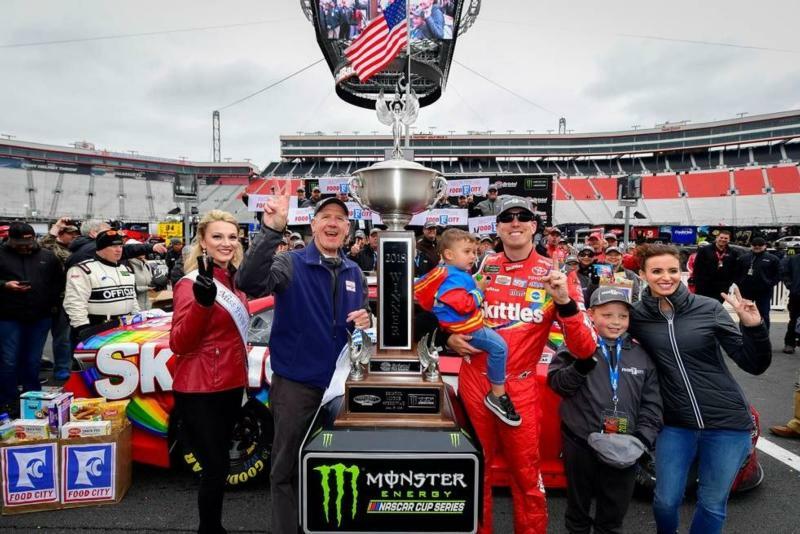 The Food City 500 is his second consecutive Monster Energy NASCAR Cup Series victory this season and second in a row at Bristol. The victory further padded a Bristol resume that now features 21 wins across NASCAR's top three divisions. "When it comes down to the end, it's crunch time and you've got to go," Busch said. "I wasn't sure if I made my move too soon. I thought so, but our car was fast enough that Larson never had a shot to get back to us to repay the favor." The race started Sunday afternoon but was interrupted by weather and resumed Monday afternoon under cloudy skies and in much cooler conditions. Larson was the leader when the race resumed with 46 laps remaining in the second stage. He led 74 laps and had a more than 7-second advantage when racing ended Sunday. That trend continued Monday, but so did another for the driver of the No. 42 Chip Ganassi Racing Chevrolet. Larson's runner-up performance was understandably bittersweet because he has nothing to show for leading the most laps led in the Food City 500 over the past two years. A pit road penalty derailed his chances last year. On Monday, it was Busch's bump and run. "I knew it would be hard to get back to him," said Larson, who led 200 laps and finished 0.628 of a second behind Busch. "I knew I would need a lapper to kind of hold him up on exit and kill his momentum to allow me to maybe get back to his bumper, but there just weren't a whole lot of cars left out there." Busch and Larson are no strangers to running one-two at Bristol. Three times in the Xfinity Series, they've finished first and second. Busch won each. "Larson and I are neck and neck," Busch said. "It seems like whoever can get out front kind of seems to have it. Larson was out front today at the end and it just seemed like he was a little bit too loose. It comes down to perfection and having to have your racecar be perfect. I'm not so sure that he had that there at the end. I wouldn't say mine was perfect either but mine was a lot closer than his was." The final results Monday were encouraging for Hendrick Motorsports. It placed seven-time Cup Series champion Jimmie Johnson and Alex Bowman in the top five. Johnson, the defending Food City 500 winner, finished a season-best third after starting the race at the back of the field in the No. 48 Chevrolet. Bowman finished fifth. "It really is a great boost," Johnson said. "I've said for weeks now that we're getting better and it's great to finally have a result to back that up. We've had decent Fridays and really good Saturdays and then some bad luck in the races. Although we had plenty of bad luck over the course of the four or five days that we've been here, we were able to pull through and get a great third place finish." Arguably no driver overcame more obstacles over the two days than Ricky Stenhouse Jr. The driver of the No. 17 Roush Fenway Racing Ford spun on Sunday and incurred a pit road penalty. He and his team persevered and were second behind Larson with 20 laps remaining. Stenhouse finished fourth and was left to ponder the what-ifs had there not been a late caution Monday. That caution was brought out when Brad Keselowski, who won the first and second stages of the race, experienced a problem with his left front tire and hit the wall. At the time, Stenhouse was racing on fresher tires than the rest of the lead cars. "The newer tires that we had were gonna be better for us to catch the 42 (Larson) on the long run," he said. "My spotter was kind of keeping me posted once I got into second where the 42 was and I was gonna start pushing really hard there to run him down over the last 30 laps. I wish it would have stayed green. That would have been nice, but then that caution came out and I still thought we were gonna have a shot at it." The garage opened at 10 a.m. Monday. As teams returned to the track, it was 30 degrees cooler than at the same time the day before. Naturally, the wild swing in conditions raised the question of how it might affect the race cars and track. It also increased the demand for fleece blankets, hooded sweatshirts and gloves at souvenir stands below the grandstands. The green flag fell just after 1:30 p.m. under cloudy skies and with a thermometer reading of 40 degrees. Joe Gibbs, the winning car owner, praised the fans who stuck it out this weekend. "Our fans are just awesome," said Joe Gibbs, the winning car owner. "We've had some tough weather over the weekend since we started this year off. Appreciate our NASCAR fans and everybody that showed up today." Crews refreshed the traction compound with a light application of it Monday morning and drivers stuck to it throughout Monday's racing. Keselowski passed Larson with 12 laps remaining the second stage for his third stage win this season. Denny Hamlin slipped past him at the outset of the final stage. Four laps after taking the lead, however, Hamlin was forced to pit because of a loose wheel. He finished 14th. Larson regained the lead on Lap 293 and was comfortably ahead on Lap 324 when he took the high line around Turn 3 then pulled down in front of Ryan Newman, clipping the front of Newman's car. The contact sent Larson spinning but he miraculously managed to escape without damaging his car. Busch was second at the time and swerved to avoid hitting Larson. The resulting caution brought drivers to pit road. Busch maintained the lead after pit stops and the race restarted with 171 laps remaining. The sun started peeking through the clouds with 150 laps to go. Shortly thereafter, a crash brought out another caution. While most opted to pit for fuel and tires, Daniel Suarez and his No. 19 Joe Gibbs Racing Toyota decided to stay out to lead his first laps this season. Busch lined up behind his teammate on the restart followed by Johnson, Keselowski, Larson and Darrell "Bubba" Wallace Jr.
Keselowski passed Suarez for the lead on the restart lap and Wallace moved into second place. Nine laps later, Wallace passed Keselowski on the inside for the lead and led his first career laps as a Cup Series driver. Over the radio, Wallace was encouraged to settle in, to drive nice and smooth and avoid making mistakes. By no mistake of his own, Busch passed Wallace to move back into the lead with 129 laps remaining. Around that time, NASCAR brought out the yellow flag for a brief weather delay. Most drivers stayed on the track. Kevin Harvick, Logano, Stenhouse and Suarez pitted. Busch put Keselowski a lap down then got passed for the lead by Larson with 61 laps remaining. Larson then put Wallace a lap down 54 laps from the finish, leaving 13 cars on the lead lap. Wallace finished one lap down in 16th place but was the highest finishing rookie. Keselowski finished 23rd. Over the course of the two days, the Food City 500 was slowed by 13 cautions but featured 18 lead changes among eight different drivers. "This place almost always puts on an incredible race," said Adam Stevens, Busch's crew chief. "There's so much that the driver can do behind the wheel, adjusting his line, you know, what little adjustments he has inside the car, and chasing the rubber as it moves around the racetrack and as the groove changes, and it always puts on a good show." For Busch, Monday's victory is his 45th in 470 career Cup Series starts. Now 32 years old, the past champion is showing no signs of slowing down at Bristol, or elsewhere. "I enjoy working with my guys an awful lot, and I just feel like we're clicking on all eight cylinders right now," Busch said. "That's just a great thing to have, and it gives you a lot of confidence when you can go to the racetrack with these guys."